Venicci has been awarded by Mumsnet the "Best of 2015" badge, making it one of the highest rated baby products. Venicci Pure Prestige Edition is an EXCLUSIVE suitable from birth travel system, it comes with a white chassis with special "Pure" fabrics & colours, and combines style with functionality in a great value 3in1 Travel System. The Venicci White chassis is built using lightweight aluminum, which brings a set of advantages. Because of its light weight, it's easy to transport or carry when folded. Easy controlling & maneuvering of the pram is ensured by both the light frame and the adjustable suspension, guaranteeing a smooth ride on any type of ground. Aluminum also provides a sturdy, durable frame. The four wheels have air tyres, which are capable of taking on rough terrain. Front swivel wheels are lockable. At the rear you will find the brake pedal. The handlebar can be adjusted from the range of 75cm to 110cm. Venicci White chassis also provides you with a very generous shopping basket for your storage needs. Folds down easily with the forward facing seat unit still attached. The ventilated leatherette white carrycot is suitable from birth and can last up to 6 months/9kg approx due to it being lieflat, and having great size. Backrest can be raised and has 4 positions, for when a small baby is in between the laid flat and seat unit stage. Inside the carrycot you will find a mattress, luxury cotton lining. The fabrics are durable, and are weather-resistant. Hood is adjustable to your needs, and a carry handle is integrated for ease of transportation. 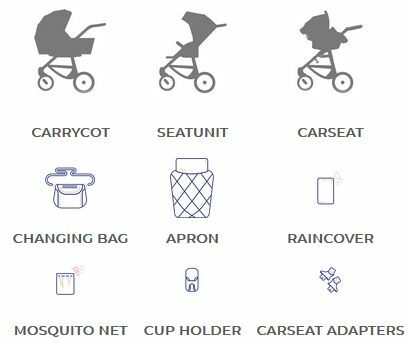 Carrycot is easily installed and removed from the frame using Click-Mode. Seat Unit can be turned either forwards or parent facing, and has a 3 position recline: from fully upright to lieflat. Seat unit is fully ventilated from the back of the hood. The hood is adjustable and extendable. For safety and additional comfort, you will find a five-point safety harness, a leg rest and a leather-finished bumper bar implemented in the seat unit. All three are adjustable to specifications you require. A handy mesh pocket is implemented on the back of the seat unit so that you can keep your essentials close to hand. The new and updated car seat is suitable from birth up to 13kg, and can be fit on its own via seat belts or by using an ISOFIX base. (sold separately). The car seat only weights 3 kg, which is very lightweight and therefore easy to carry. Inside you will find a comfortable padded interior, foam wedge support and padded adjustable 3 point harness. Manufactured in accordance with the ECE R44/04 safety standard.